Known locally as Charlotte Street School I fondly remember seeing the girls in their all brown uniform going to this school.you know for all the years I lived in Brigton I never knew Charlotte St School's real name!! Aug.2005 photo from Josephine Banner (nee Smith), California, USA. Front Row 1. 2. 3. Emily Rigley 4. If anyone remembers me send e-mail- would love to hear from you. I ran around the Garngad with Theresa Croal and she was a wild one - had a great time growing up. Now live in USA these past 44 years. I think I can put a name to one of the photographs it is Our Lady & St Francis school c1951 number 5 on the top row is Margaret Walsh (my older sister) I am sure it is her she would be 15 in 1951. We lived at 151 Mordant Street in Bridgeton. 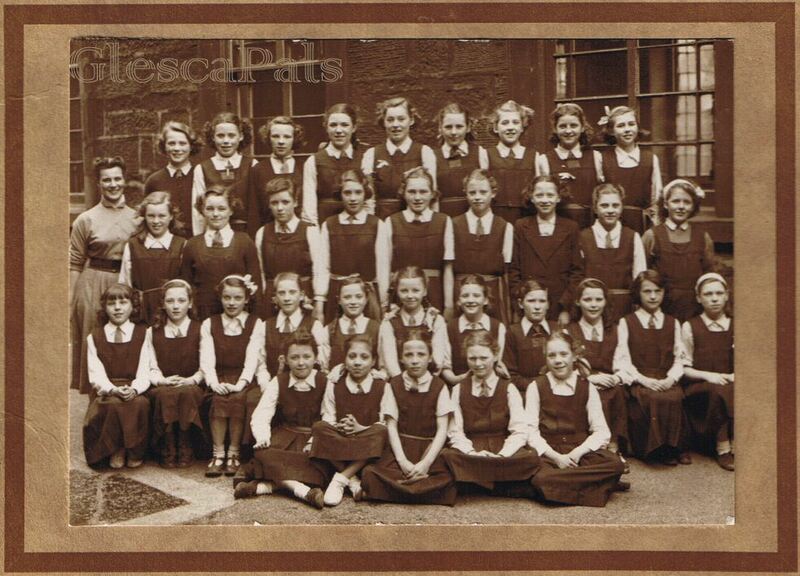 I came across your site when I was looking for a class photograph of my old school St Modans in Cranhill c 1956/57 Havent found one yet but will keep looking! Dear Webmaster - I believe the name of the 9th person on the top row is Mary McCall. Thank you and best regards, Maureen Hughes Barker...10th person on 2nd row.